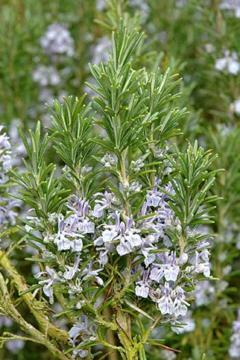 Aromatic evergreen shrub from the Mediterranean area, with narrow grey-green leaves and small pale blue flowers in spring. Thrives in very well drained, poor soils, preferably neutral to alkaline, in full sun. Dislikes excessive winter wet. Best to cut back regularly in spring to retain a bushy shape and prevent the plant becoming leggy. Can be damaged by severe winters in cold areas. Traditionally used as a culinary herb, but also makes an attractive ornamental shrub for hot, dry positions such as a Mediterranean style garden. Can be used as an informal hedge in mild areas. Medicinal herb, strongly antiseptic and anti-inflammatory, also a good general tonic. An essential oil is distilled from the leaves. Used extensively for perfumery and toiletries.